LittleBits Premium Kit is a set that allows inventing anything you can imagine. 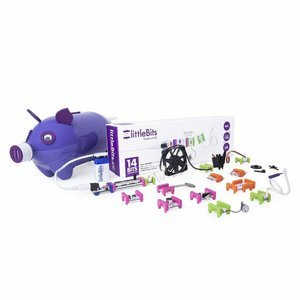 This Kit is the perfect way to unleash creativity in kids and young inventors, empowering them to create inventions of every shape and size, with no prior electronics experience. Heftier than the Base Kit, it unlocks more powerful interactions with bits like the servo and vibration motors and is perfect for makers who want a deeper intro into inventing. Inventors can learn the basics of electronics, explore STEAM/STEM principles, form the foundations of critical thinking, or just have fun with whirring, buzzing creations. The kit contains several modules that are not available in other kits, such as fan, pressure sensor, and vibration motor and works with every other LittleBits module and kit. Over 600,000 circuit combinations possible. Includes booklet with instructions for 10 inventions and hundreds more online. Download User Manual for LittleBits Premium Kit. fan module — 1 pc. slide dimmer — 1 pc. roller switch — 1 pc. branch module — 1 pc. long led — 2 pcs. power module — 1 pc. pulse module — 1 pc. vibration motor — 1 pc. pressure sensor — 1 pc. servo module — 1 pc. set of servo accessories — 1 pc. sound trigger — 1 pc. battery and cable — 1 pc.